I managed to process some more panoramas over the last week. I did some from my previous holidays, and also one of the park in town where I live (Market Harborough). 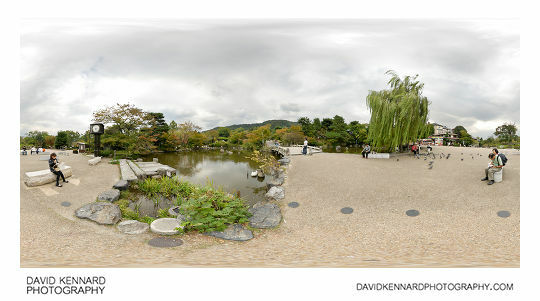 You can see the interactive 360° VR version here: Maruyama Park, Kyoto 360 VR. I took this pano during my trip to Japan in October 2008. Here you can see the pond at Maruyama park in Kyoto. You can't see it in the small version above, but there was a heron standing on a stone in the pond. It didn't seem to be bothered by all the people at all. 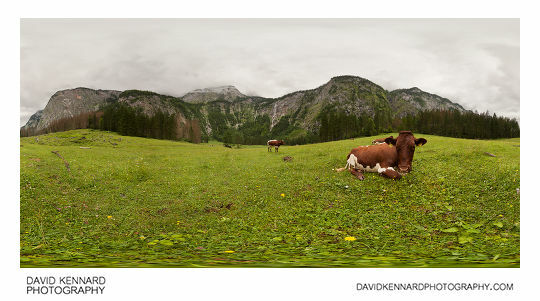 You can see the interactive 360° VR version here: Cows in meadow near Röthbachfall, Königsee 360 VR. This pano is from my recent trip to Bavaria in July. I took it on the way back from visiting the Röthbach waterfall near Königsee. Königsee is a large lake surrounded by mountains, this area is at the other end of Königsee, so you have to get a boat across the lake to access it. There are regular tourist boats across the lake so this is not difficult. One of the things I really liked about Bavaria was the cowbells that the cows wear. It's nice walking up in the mountains and hearing the sound of cowbells. I think only one of the cows in this meadow had a cowbell though. Although it might not look like it, I had to get very close to the cow to get it this size in the image. Thankfully it stayed still except for the zenith (up) shot where it stood up, but this wasn't a problem. The last thing to say about this panorama is that I processed it as a 16bit Photoshop file. However, I won't be doing this again with a panorama as it made my computer really slow. 16bit seems to work okay for individual files and exposure blending of single images. But for multiple shot panoramas, the file is just too large for my PC to handle. I think I would want a PC with at least 24GB of RAM and an SSD scratch disk for processing panoramas in 16 bit. (My current PC has 8GB RAM and RAIDed standard HDs). 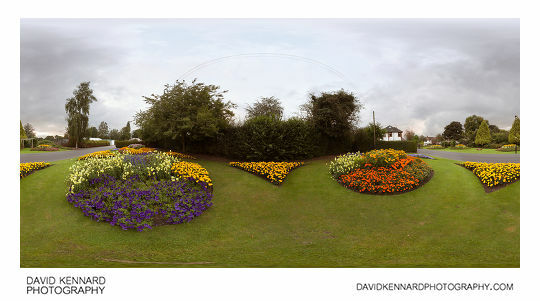 You can see the interactive 360° VR version here: Flower displays at Welland Park Summer 2012 360 VR. This is my local park, Welland Park. They always plant nice flower displays here in time for the East Midlands in Bloom competition. In this pano you might notice that some areas are quite blurry. This is because it was windy and I had to use a slow shutter speed for a reasonable exposure. Another problem is that some of the flowers are blown out. Not blown out completely, but one (or more) of the colour channels are blown, resulting in an overly bright and saturated flower. The only way I know of dealing with this is by doing HDR / exposure blending. But I couldn't do that with this image as the flowers were blowing about too much between the exposures. Even when this is possible, I still find it very difficult to strike a balance between pulling back the exposure, while keeping the flowers bright and colourful. If anyone has tips on avoiding blown channels with flowers, they'd be much appreciated! With this pano, I used the latest version of Adobe Camera RAW (ACR) to process the TIFFs. They've changed the way fringing removal works, so instead of having a 'defringe' and 'defringe all edges' checkboxes, they have two sliders for purple and green fringing removal. After processing all the TIFFs and creating the panorama in PTGUI, I started work on the panorama in Photoshop (mostly looking for and cleaning up blending errors around seam edges). But then I noticed that the purple flowers were looking rather strange. I had cranked up the purple fringing removal slider to 20 (maximum) in ACR when converting the RAWs, and this did a good job of removing purple fringing around tree branches. Unfortunately it also removed a lot of the purple colour from the purple flowers. So I had to go back and re-process the RAWs (and then the pano) without the PF correction. Then I just removed purple fringing in the old fashioned way, using a hue/saturation adjustment layer. That way I could use a layer mask to make sure the adjustment didn't apply to the purple flowers. The tree near the house looks a bit strange in this panorama, which I thought might be due to using the green fringing removal in ACR. But no, it looks like that in my original photos. It looks a bit like a green tree with red-brown leaves in the centre. But I think actually it is a tree with red-brown leaves, and then another tree with green leaves is behind it. One other problem you might notice with this panorama (though hopefully you wouldn't notice it if I didn't point it out) is the telephone lines. They were blowing about a bit in the wind, so didn't match up completely between the images. This might also be due to my camera not fitting on my pano head correctly for the zenith image. I did my best in Photoshop to make them fit together, but it's not perfect. You can see the interactive 360° VR version here: Allt na Criche Woodland in Autumn 3 360 VR. 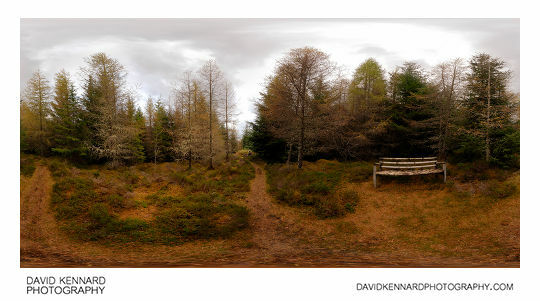 This pano was taken during my holiday to Scotland in October 2011. It was taken around the highest point of a walk in an area called Allt na Criche, which is near the Fort Augustus end of Loch Ness. We did visit Fort Augustus after this walk, but I didn't take any photos there as it was raining (and I didn't have anything to protect the camera). The woodland floor along much of the walk was covered with brown pine needles. You can also see a lot of lichen hanging from some of the tree branches, something that seems very common around Loch Ness. You might notice that despite being taken at different times of day, different times of year, different years, and different countries, these panos all have one thing in common. The sky is cloudy and grey in all of them. This isn't on purpose, I actually prefer a blue sky (ideally with a few clouds) for pano photography. But the weather wherever I go always seems to be overcast much more often than it is sunny. The good things about the cloudy skies in these panoramas though, is that they do at least have some texture in them. They're not just flat grey overcast skies. Very nice work David, i can see you put alot of time and effort into your website to make it as informative as it is. I have studied some of your tutorials which i find very useful, and thank you for them being made available to the “public”. I use ‘Hugin’ for all my stitching needs – not too sure if your ever heard of it but it is very useful, and some clever programmers have made it free and opensource. maybe worth a try if Photoshop plug in slow down your computer? Thanks for your comment. I have used Hugin before, but didn’t find it as easy to use or as stable (would crash sometimes) or to produce as good results as PTGUI. It’s the editing of the files in Photoshop to produce an exposure blended panorama without artifacts from moving people, trees blowing in the wind etc, that really brings my PC to a crawl.